I want to bring something into the open. They say the first way to resolve a problem in your life is to be honest with yourself and those that matter to you. I’m a bad boss. Sometimes I’m even a terrible boss. I’m not always the best listener, I forget to check my emails and I talk over people in meetings. The problem is, I’m not alone in this and it needs to stop. According to a Forbes survey “What employees really think of their bosses”, 25% of employees think they can do a better job than their boss. That’s a lot of bad bosses. Although I am numbered among them, I am committed to being part of the solution. I have decided to start a movement. It takes one person to have the courage to stand up and take responsibly to lead the charge for a better future. We have invested over two years in research with some of the leading behavioral scientists and think tanks in Canada. Today is the first official Boss Awareness Day (B.A.D.). The purpose of this day is to truly bring to light the changes required in our business culture to hold leaders accountable to a new standard, one that honours and respects all people in an organization. We have also created the the Boss Awareness Tool (B.A.T.). This has come as a result of our two year secret project involving some of the leading behavioural scientists and has been tested in a number of fortune 500 companies. By using the B.A.T. we have seen a 32% increase in employee engagement, 18% increase in profitability, 47% reduction in stress leave and a remarkable 73% reduction in turnover. Are you a bad boss? Don’t worry, you can be a part of the solution too and even come out ahead. It’s as simple as 1, 2, 3. 1. 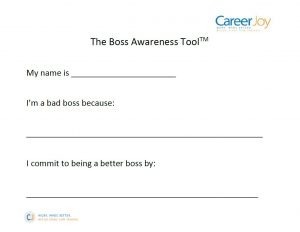 Download the Boss Awareness Tool and fill it out. 2. 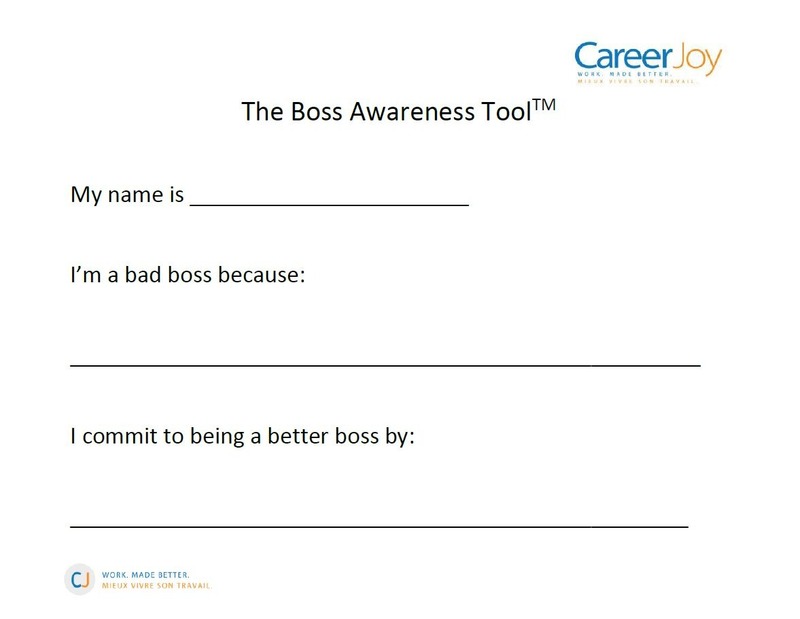 Share a photo or video of your completed Boss Awareness Tool on social media @CareerJoy with #BossAwarenessDay. Speak out against the stigma of bad bosses. 3. You’ll be entered to win a Leadership Development Program valued at $1850 to help you become a better boss. Not a boss yourself? Don’t worry. I’ll let you in on a secret…we won’t actually check if you’re a boss. All employees are welcome to enter the contest.